I used the Math Numeration 1 program as a supplement to my Saxon Math Program. We tried to use the program twice a week for about 25 minutes a session. Most of my students were finished with the program by Christmas time. Please find the attached math data I've collected from our school year for my 17 1st grade students. There are 3 pre and post tests given in August and May. 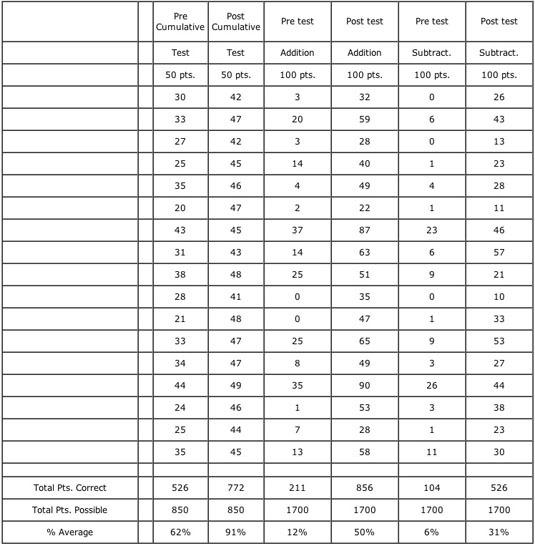 The cumulative test covers our whole math curriculum. The addition and subtraction tests are math facts. As you can see from my data my class average on the cumulative test went from 62% to 91%. My students average on the addition facts went from 12% to 50%. My students average on subtraction facts went from 6% to 31%. Data from all students including special ed students were included in my results. I think the math numeration program is GREAT! My students always looked forward to working on the program. The management program was awesome. I used the reports at conference time to show parents their child's progress. Thank you for allowing me to participate in your study. I'm looking forward to using the Essential Skills Programs again next year.